Product ideas to accelerate recovery, relieve pain, and improve your pet’s quality of life. 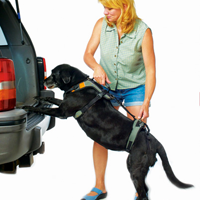 Dog Harness: By Help’em up Harness A complete shoulder and hip harness system that literally lifts the lives of aging or recovering dogs! By placing a pair of handles where you can quickly reach them, this unique harness allows you to lend support at any time.The harness is especially helpful for owners whose dogs are feeling the effects of aging or health issues. It’s also perfect for Veterinarians and Orthopedic Surgeons who work with dogs recovering from injuries or surgery. In fact, the pain it minimizes may very well be your own! Help Em Up Harnesses are available for purchase from $130 – $150 depending on the size and weight of your dog. Fittings are available in clinic free of charge. Outside of the GTA please contact us for shipping rates. We suggest you call for a fitting before/after purchase.